Despite the struggles of the women’s basketball team, Webster University junior Ashley Brooks has proven she can be a reliable option for the squad. She has improved in nearly every statistical category. In just her second season at Webster, Brooks says she has a high level of confidence in herself and her teammates. 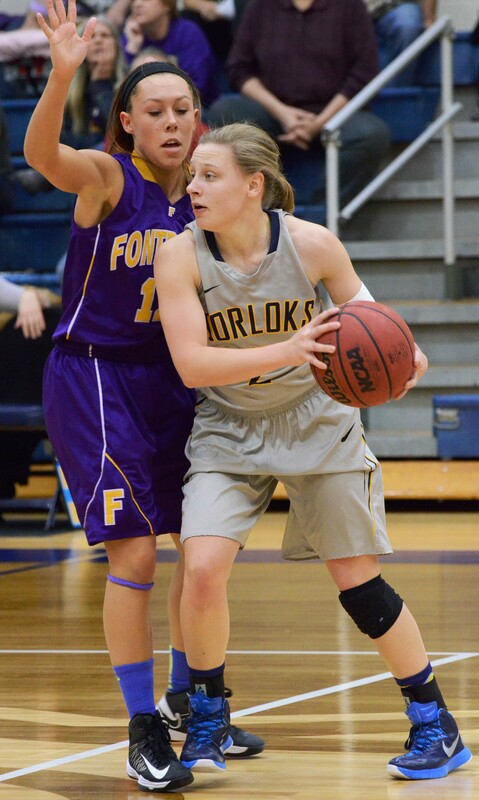 Ashley Brooks looks to find a teammate in Webster’s 52-47 victory over Fontbonne on Jan. 17 at Grant Gymnasium. The team has a losing record of 6-9, they have lost eight of their last ten games and they have suffered three losses by 20 or more points. Last season Brooks averaged 6.8 points and 3.5 rebounds per game and started 10 of 27 games. This season however, she is averaging 10.7 points per game along with 5 rebounds, 3.3 assists and has started in all 15 games. Most of her offensive production comes from behind the 3-point line. Last season she was 15th in Webster’s all-time single-season rankings as she made 29 three point field goals. Brooks credits her shooting success to the work she puts into her shot to make sure she’s sharp when game time comes around. This season she has connected on 17 three point shots and is on pace to better her mark from last year. Head Coach of the women’s basketball team Jordan Olufson spoke about Brooks’ talent and level of progression. However, Brooks nearly did not arrive at Webster in the first place. Coach Olufson and his staff tried to recruit her when she was coming out of high school, but she had already committed to Maryville University. But after a year of dealing with playing time and injury issues at Maryville, she knew she needed a new start and she looked again at Webster. This season, She scored 25 points in a win over MacMurray College on Nov. 29 and in the team’s regular-season opener on Nov. 15, she scored 20 in a win over Dominican University. Brooks’ contributions are also catching the attention of teammate Cassie Endicott. Endicott is the team’s only senior and she leads the team in rebounds and blocks. She may be looked upon to be the leader of the team this season, but she says she is confident that Brooks will be able to fill her void next year when she becomes a senior. Despite the obstacles, the women’s team has faced so far, Brooks has confidence that the team will bounce back from this difficult stretch. The team defeated Fontbonne University in their most recent game, 52-47 on Jan. 17. Coach Olufson stressed that continuing to play hard and staying calm in the face of calamity is key. He says he has faith in Brooks to play a huge role in the effort moving forward. “We’ve had some injuries and some setbacks but with (Brooks’) talent and leadership potential, I think she’s going to have a huge impact on us,” Olufson said.